Few challenges are more daunting than feeding a global population projected to reach 9.7 billion in 2050—at a time when climate change is making it increasingly difficult to successfully grow crops. In response, corporate and philanthropic leaders have called for major investments in industrial agriculture, including genetically modified seed technologies. Reporting from Africa, Mexico, India, and the United States, Timothy A. Wise’s Eating Tomorrow discovers how in country after country agribusiness and its well-heeled philanthropic promoters have hijacked food policies to feed corporate interests. Most of the world, Wise reveals, is fed by hundreds of millions of small-scale farmers, people with few resources and simple tools but a keen understanding of what to grow and how. These same farmers—who already grow more than 70 percent of the food eaten in developing countries—can show the way forward as the world warms and population increases. Wise takes readers to remote villages to see how farmers are rebuilding soils with ecologically sound practices and nourishing a diversity of native crops without chemicals or imported seeds. They are growing more and healthier food; in the process, they are not just victims in the climate drama but protagonists who have much to teach us all. 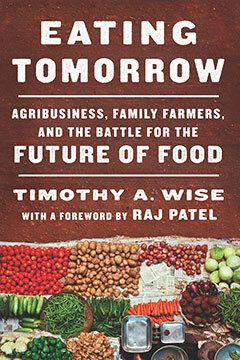 "[I]n Eating Tomorrow, Timothy Wise writes a powerful polemic against agricultural technology that is sold to developing countries as progress towards the common good, but that ends up as a tool of agribusiness oligopoly and profit."